Last Week in Review: The economic report calendar was quiet, but a window of opportunity appeared. Forecast for the Week: Look for key reports on housing, consumer attitudes, inflation, manufacturing and economic growth. Plus the Fed meets. View: Conquer clutter with the great tips below. "If a window of opportunity appears, don't pull down the shade." Tom Peters. The markets were closed Monday in observance of the Martin Luther King, Jr. holiday and the economic calendar was light, but last week still brought an opportunity, as home loan rates reached some of their lowest levels in months. Despite the quiet calendar, there was news to note in the housing arena. The National Association of Realtors reported that Existing Home Sales rose by 1 percent from November to December to an annual rate of 4.87 million units. This was the first monthly gain in three months. For all of 2013, there were 5.09 million existing home sales, which was 9.1 percent higher than 2012. The housing market continues to rebound, though at a modest pace. Meanwhile on the labor front, weekly Initial Jobless Claims were reported at 326,000, up 1,000 in the latest week and nearly in line with expectations. Initial Jobless Claims have been trending lower since the distortions brought on by seasonal holiday hiring. The labor markets were pointed in a positive direction up until the weak December Jobs Report. The Fed will be watching closely to see if the December report was an anomaly...or a sign of things to come. What does this mean for home loan rates? The housing and labor arenas are two key areas that the Fed is monitoring, as it decides whether to further taper its Bond purchases. Remember that the Fed is now purchasing $40 billion in Treasuries and $35 billion in Mortgage Bonds (the type of Bonds on which home loan rates are based) each month to stimulate the economy and housing market. This figure is down from the $85 billion in Bonds and Treasuries the Fed had been purchasing last year. The Fed has stated that its decision to further taper these purchases will be dependent on economic data. The upcoming Fed meeting on January 29-30 will be closely watched, as investors will be waiting to see if the Fed will taper these purchases further. This decision could have a big impact on Mortgage Bonds and home loan rates, and it's a key story to watch this week and throughout the year. The bottom line is that now remains a great time to consider a home purchase or refinance, as home loan rates remain attractive compared to historical levels. Let me know if I can answer any questions at all for you or your clients. A busy economic calendar is ahead. Plus the Fed meets. In housing news, New Home Sales will be released on Monday, the S&P/Case-Shiller Home Price Index on Tuesday, and Pending Home Sales on Thursday. We'll get a sense of how the consumer is feeling with Consumer Confidence on Tuesday, followed by the Consumer Sentiment Index on Friday. Also on Tuesday, Durable Goods Orders for December will be released. Look for Weekly Initial Jobless Claims and Gross Domestic Product on Thursday. Ending the week, Friday brings a slew of key reports, including Personal Income, Personal Spending, the inflation-measuring Personal Consumption Expenditures, and Chicago PMI. In addition, the Federal Open Market Committee meeting kicks off on Tuesday, with the monetary policy statement set for delivery on Wednesday at 2:00 p.m. EST. When you see these Bond prices moving higher, it means home loan rates are improving — and when they are moving lower, home loan rates are getting worse. To go one step further — a red "candle" means that MBS worsened during the day, while a green "candle" means MBS improved during the day. Depending on how dramatic the changes were on any given day, this can cause rate changes throughout the day, as well as on the rate sheets we start with each morning. 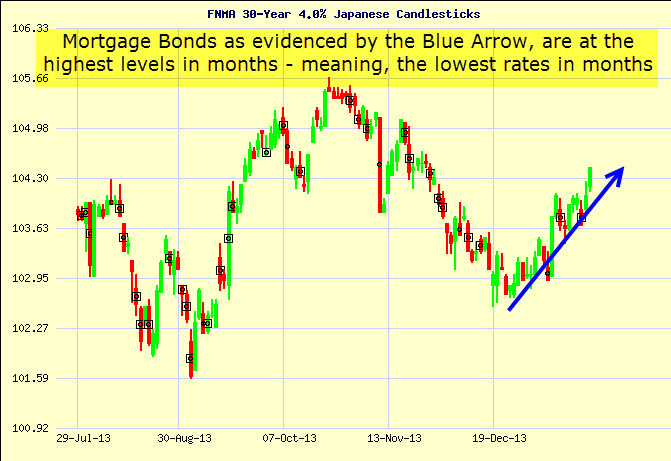 As you can see in the chart below, Bonds have been on an improving trend, meaning home loan rates have also improved. The Fed meeting could have a big impact on the markets this week and I'll be watching closely to see what happens. Digital files are your best weapon in the battle to conquer clutter. By Lisa Gerstner, Kiplinger.com1. Stop paper buildup in its tracks. Sign up to receive online statements and bills from utilities, banks, credit card issuers and other service providers. To help stay on top of payments, sign up for your bank's bill-paying service. Or link your accounts to Manilla.com. The tool, which includes a mobile application for Android and iPhone, organizes and stores documents online and sends alerts when bills are coming due.2. Scan, scan, scan. A good scanner can eliminate a mountain of paper. The Fujitsu ScanSnap iX500 desktop scanner ($405 on Amazon.com) connects wirelessly to your PC, creates searchable PDFs, and can handle two-sided scanning. Once you've digitized those documents, take them, along with all the other unwanted items sitting on your desk or dining room table, straight to the shredder. Your community may sponsor periodic mass shredding events. A good shredder for home use is the Fellowes Powershred W-11C ($66 at Amazon.com). 3. Prepare a backup plan. Save important documents in multiple places in case your computer fails, says Julie Bestry, president of Best Results Organizing, in Chattanooga. In addition to keeping copies on an external hard drive or a flash drive, store documents using secure "cloud" services. Dropbox, for example, lets you save 2 gigabytes of data free (and you can share folders with other users). With Google Drive, you can store up to 15GB of files as well as create text documents, spreadsheets and slide shows. The free online tool Evernote lets you save PDFs, clip articles from the Web and create text documents. File items in folders and add tags for easy searching. 4. File it on the fly. A scanner that fits into a bag or suitcase can be useful for, say, digitizing handouts while you're at a conference, says Erin Rooney Doland, editor in chief of Unclutterer.com. For example, the 12-ounce Fujitsu ScanSnap S1100 ($180 on Amazon.com) can process letter-size documents as well as receipts, postcards and business cards. And plenty of mobile apps can help you keep paper to a minimum, too, though they may not provide the image quality that a scanner does. With the free version of the CamScanner app (for Android, iPhone and Windows Phone), you can snap photos of documents with your phone's camera and convert them to PDFs. The CamCard Free app lets you photograph business cards and store and file the contact information. With the free Bump app (for Android and iPhone), you can share your contact information by tapping your phone with phones of other app users. 5. Get a handle on receipts. To organize all of your receipts and track spending, try OneReceipt for iPhone, which lets you snap pictures of receipts and save them by using the free app or e-mailing them to your account. The tool can also automatically pull electronic receipts from your e-mail account. Not sure the store will accept an image of a receipt? Hang on to the original. 6. Paper still has a place. In addition to Social Security cards, and certificates of birth, death and marriage, you'll want to keep estate documents, medical records, insurance policies, proof of mortgage and other loan payoffs, and titles and deeds for cars and homes. Reprinted with permission. All Contents ©2014 The Kiplinger Washington Editors.